Nineteen Eighty-Three and a Third is an office-based sitcom set in the dystopian world of Good Britain, where a sinister, totalitarian government rules behind a benevolent façade. Our window into this strange new world is protagonist Richard Bupkis, a pencil-pushing curmudgeon who labours away within the Department of Review. Alongside a cast of quirky co-workers, Richard’s job is to ensure that no offensive or potentially subversive material reaches the public. 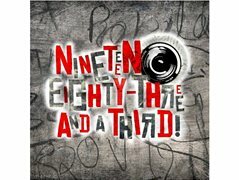 Nineteen Eighty-Three and a Third examines contemporary themes of censorship, media control, surveillance, and political correctness. However, the show also explores the minutiae of everyday working life; the frustrating nature of office politics, the soul-sucking tedium of dead-end jobs, the horror of a broken coffee machine on a Monday morning. The show will look to strike a tone akin to Blackadder Goes Forth, melding social commentary and political satire with quick-fire comedy. This is a multi-camera production created by students at the University of York as part of the final year of our degree. Rehearsals to take place between the 18th February and 17th March, shooting over three days between the 18th March to 1st April (exact dates to be confirmed). Richard Bupkis is a pencil-pushing curmudgeon who labours away within the Department of Review. His job is to ensure that no offensive or potentially subversive material reaches the public. He's a habitual moaner with an acid-tongue, hurling constant sarcasm and thinly-veiled insults at his dim-witted co-workers. Despite considering himself a cut above, Richard is entirely incompetent, often bested by simple tasks. Anastasia is a new worker in the office, but secretly a member of the resistance movement against the governing powers of her world. Her parents and sister were separated from her when she was young, which led to her being taken into foster care, and trained from a young age as a child soldier for the resistance. She's tough, clever, and beautiful, and attracts the attention of Richard. Sunny is Richard's secretary and his punching bag. She's bubbly, fun, and innocent, and the person in the office most competent at her job. Buster is the idiot of the office. He's messy, easily frazzled and never does his work (or, on the occasion he does, it is bad to an impossible degree). He is the illegitimate son of the office's Boss, and has been handed his position. He is the boss of the office. He's dimwitted but a lighthearted goof, with a hard side when it concerns his son, Buster, whom he verbally abuses.